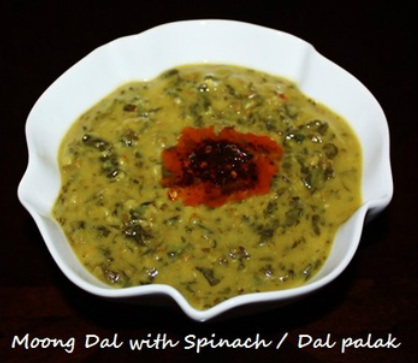 Moong dal with spinach is a wonderful healthy combination of green. This is a great way to get your greens and protein. 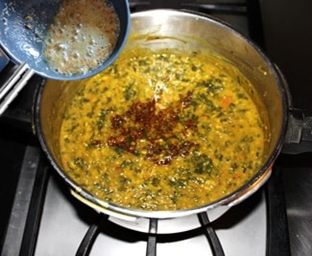 It is an easy, healthy and flavorful dal made with palak (Spinach) and moong dal (green grams) and tempered with tomato, onion and garlic tadka. This is a very adaptable awesome dish and cooked in different ways with different lentils and different spices depending on the region where it is cooked and personal preferences. It is a main course dish and can be served with rice or chapattis. 1 Medium size ripe tomato – chopped in to small pieces. 1. In a pressure cooker add dal and wash, changing water several times until the water appears clear. 2. Once Dal is soaked wash and rinse. ​3. Add thawed or fresh chopped spinach and 5 cups of water. 4. Add Turmeric powder and salt and mix everything together, close the lid of the pressure cooker and place the weight on the lid, turn the heat to medium high. 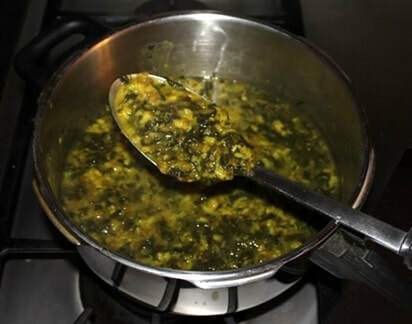 spinach and moong dal blend in together. 8. Moong dal should get over cook so that spinach and moong dal blend in. cook, stirring frequently so that dal does not stick to the bottom. ​ tadka, cook for1 minute and turn the stove off. 2. Use pressure cooker to cook dal, otherwise it takes too long to cook the dal. 1. 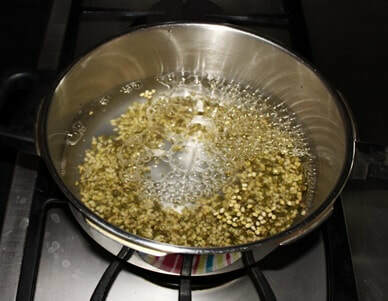 In a small pan (tadka spoon) add 1 tablespoon oil, cumin seeds, and pinch of asafetida and fry them for 2 to 3 minutes or until cumin seeds become dark brown. Take it off the stove. 1. In a small pan (tadka pan) heat 2 tablespoons ghee or melted butter add crushed red chilies or red chili powder and fry them on very low heat for 1 to 2 minutes or until the red chilies fried, turn the heat. 1. On medium heat in small pan heat 2 tablespoons oil, add chopped onions and minced garlic and sauté them 5 to 7 minutes, or until they become light brown. Frequently keep stirring the onions. 2. Add chopped tomatoes, grated or chopped ginger and chopped green chilies and cook. With the spatula try to mash the tomatoes so that they become soft quickly. In about 5 to 6 minutes tomatoes will become soft and blend in with onions. Turn the stove off.